I haven't finished any of my garment projects that I have planned for January. I've been distracted a little bit by some other sewing related yet not-actually-sewing things. I've been working at my large embroidery project, something I can do while watching movies -- which I did a lot more of than usual over my holiday break. 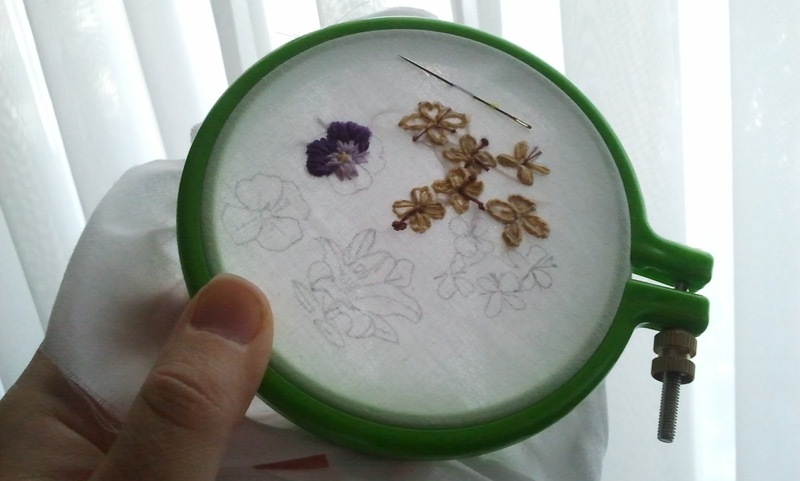 So I discovered that it is kind of nice to have an embroidery 'sketch book' so to speak; I traced some of the flower motifs from the big project on to some scrap cotton, and popped it into a small embroidery hoop to test out some stitches and see which ones I liked best for the various flowers. This is a free-form project that I'm just making up as I go along, and I found that using this small hoop lets me see how things will look and how to combine stitches. Sometimes you've just got to learn by doing. 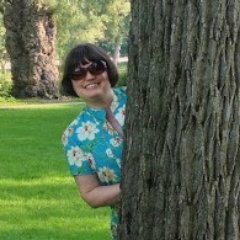 I've also been reading a lot, both fiction for work and for pleasure, and a whole whack of craft books that I bought from a discount outlet, as a kind of late Christmas gift to myself. There are some sewing books, some embroidery books, and one odd little tatting book -- that's a skill I want to learn someday, I've even bought a Craftsy class on the topic. Oh, for more time! And of course I've still been checking out the thrift stores, and came across this lovely piece of fabric still labelled with its New York provenance. 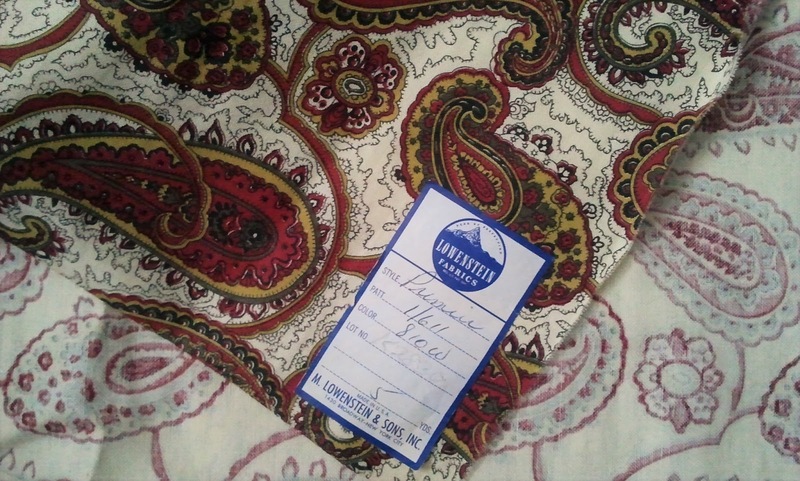 I bought nearly 3 yards for $1.50. Lucked out on the textile sale day! I think this will help me fulfill my goal of sewing something for my husband this year. It looks like a waistcoat to me... Any other ideas? 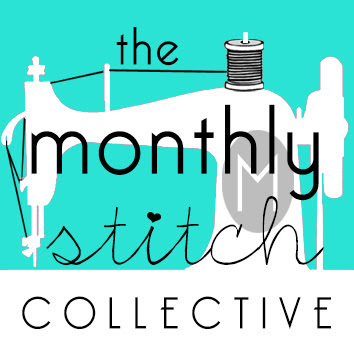 I hope you're all having fun with your 2016 sewing too, whether it's actually stitching or just dreaming of it! Sounds like you got a good plan. 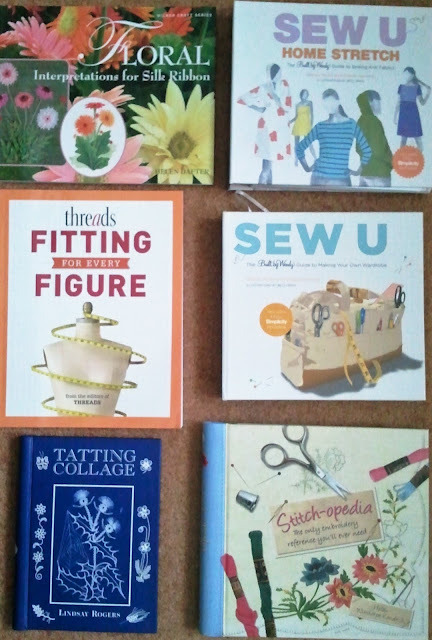 I have Sew U books too. I too want to learn tatting. My great aunt use to tat, and when she passed away my Uncle gave me some of her tatting supplies, and some projects she was working on. She made it look so easy. I'm going to have to check out the Crafty class for myself. Great find on the fabric. So neat that your aunt tatted -- my greataunt did some but I only have one of her small motifs. I'm hoping to get to the class this year! !